OYO Rooms prefer employees who can keep up with the fast pace of the company's development. More importantly, they look for "an entrepreneurial streak" in a candidate, says Dinesh R, chief human resources officer of OYO Rooms. Working in a company that is only a few years old can be both challenging and enlightening. Here is all you need to make a flying start professionally. OYO Rooms has made its presence felt in the hotel industry in just three years of existence. 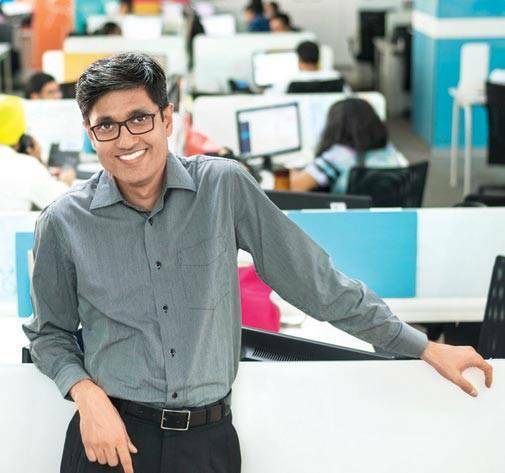 The Gurugrambased start-up, which is present in more than 170 cities across the country, prefers employees who can keep up with the fast pace of the company's development. More importantly, says Dinesh R, chief human resources officer of OYO Rooms, they look for "an entrepreneurial streak" in a candidate. "Innovation is coded into the OYO DNA, so we look for problem-solvers," he says. "Most importantly, we believe passion drives one to be more proactive. Therefore, we hire people passionate about joining us. This can be gauged from their body language and words. Our hiring processes are conservative and mature - we spend enough time with a candidate to study his behaviour closely." He adds, "We seek hustle and high energy in potential employees. The drive and conviction to make things happen is also important while working in a hyper-competitive environment such as ours. As a start-up, we also pay attention to people with cross-functional collaboration skills. Intellectual ability, rigour and a sense of ownership are other prerequisites." In this day and age, the hiring process is also aided by social media. As Dinesh R says, "Social media plays a significant role in identifying the right mix of people. A significantly large proportion of our hiring happens through social media and referrals. Social media plays an instrumental role in identifying and reaching out to a vibrant mix of people." Out of that vibrant mix of people, fresh graduates are perhaps the ones most anxious but also the ones with the newest of ideas about a particular field. The chief human resources officer of OYO Rooms has a few pointers for such potential employees: "Most graduates possess a vague idea about the industry and other practical applications. Thinking beyond academic knowledge and researching well before coming for an interview give recruits an edge." "Graduates should do their homework well before seeking an interview as it can make one stand out from the crowd. In certain specialised functions, domain knowledge is critical. We also seek candidates who are savvy and articulate, with the ability to think on their feet and not break into sweat when the tough questions keep coming." The real challenge for all firsttime employees, of course, is adjusting into the complexities of a professional life. "The comfort zone of the campus and the real world can be poles apart. Practical learning lessons in a workplace ambience can be a wholly different ballgame. Candidates in this environment should be prepared for a steep learning curve. Sometimes, newcomers may be deliberately given challenging problems to test their ability to think under pressure. There can be no big learning without small mistakes that make recruits better the next time around. Genuine errors in performing tasks don't denote a full stop, but malicious mistakes could. Most new-age companies encourage risk-taking ability as long as the checks and balances are in place," says Dinesh R.
One must also have hobbies and interests in his/her life. "In this day and age both men and women pursue - and are encouraged to pursue - hobbies and interests beyond work. This is important for both mental and emotional well-being, especially in high-pressure jobs." His advice for new recruits is that they try and get a sense of various functions and levers at their new workplace. "This helps them develop an end-to-end perspective about their role," he says, "and enables them to contribute in a more meaningful manner. A hands-on approach is essential to success in the startup domain. One should be ready to take up new challenges and in fact use the unique opportunities that start-ups provide for on-the-job learning."